The polypeptide chain on the ribosome elongates by consecutive growth from the N-terminus to the C-terminus. During the growth the C-terminus is covalently fixed in the ribosomal peptidyl transferase center (PTC), whereas the N-terminus is free. Obviously, the free N-terminal region of the nascent polypeptide chain must acquire some conformation. This implies that while the protein is being synthesized on the ribosome, it undergoes some folding that begins from its N-terminal part. Factors governing the folding of the N-terminal part of the growing polypeptide chain, however, are different depending on the distance from the fixed carboxyl end. Three zones can be considered: PTC region, a space in the ribosome body ("intraribosomal tunnel") or on the ribosome surface (channel or groove for nascent peptide), and the space outside the ribosome, but in immediate vicinity. In the ribosomal PTC two amino acid residues, the donor and the acceptor, should be positioned in a certain standard orientation with respect to each other (see Section 11.3). The likely mutual orientation of the residues in PTC corresponds to the a-helical conformation of the polypeptide backbone (Lim & Spirin, 1986). Hence, after transpeptidation, the conformation of the C-terminal dipeptide section is universal as determined by stereospecificity of PTC. This implies that, as further amino acid residues are added to the C-terminus, folding occurs from a definite starting conformation, rather than from a random chain. Thus, the folding on the ribosome should begin as a rearrangement of the starting conformation of the C-terminal section of the nascent polypeptide (Spirin & Lim, 1986). 18.1.2.Intraribosomal Tunnel for Nascent Peptide: Does It Exist? Translocation moves the aminoacyl residue preceding the C-terminal residue out of the ribosomal PTC. Subsequent additions of new aminoacyl residues at the C-terminus moves the N-terminal part of the nascent polypeptide chain further and further away from the PTC. According to the popular "ribosomal tunnel model", the polypeptide chain section, which has a length of about 30 to 40 residues beginning from PTC (i.e. from the growing carboxyl end), is still screened by the ribosome in a putative intraribosomal tunnel and is not exposed to the medium. If this is the case, the most preferable conformation of the nascent polypeptide inside the ribosome seems to be a-helix (Lim & Spirin, 1986): (i) it is the conformation set up in PTC that will be stabilized along some distance by the fixation of the C-end; (ii) it will be further stabilized within a limited space having a dimension comparable to the size of the statistical segment of the polypeptide chain; (iii) it is rigid that is required for pushing the nascent peptide through the ribosome; (iv) the a-helix is the most saturated with hydrogen bonds and hence the least "sticky" structure of a polypeptide that is also important for the passage through the putative tunnel or channel; (v) the a-helical conformation can be universally adopted by any amino acid sequence. The concept of intraribosomal tunnel for nascent peptide is based mainly on the fact that the C-proximal sequence of about 30 to 40 amino acid residues long is protected against proteinases in crude ribosome preparations (Malkin & Rich, 1967; Blobel & Sabatini, 1970; Smith et al., 1978). Visualization of structural canals and areas of a low density inside the large ribosomal subunit has tempted some workers to speculate about accommodation of the nascent peptide in an intraribosomal tunnel (see, e.g., Yonath et al., 1987; Frank et al., 1995). The length of the tunnel for the nascent peptide should be around 50 Á if the nascent peptide of the above-mentioned length were in a-helical conformation (or more than 100 Á for an extended conformation of the peptide). It should be mentioned, however, that two other enzymes-bacterial deformylase and mammalian aminopeptidase - were shown to attack the nascent polypeptide chain at the point removed by just 15 to 20 amino acid residues from PTC (Yoshida et al., 1970; Jackson & Hunter, 1970; Palmiter et al., 1978). Moreover, factor Xa protease cleaves the ribosome-associated nascent polypeptide at the 12th amino acid residue from PTC (Wang et al., 1995). These observations indicate that the putative intraribosomal tunnel for nascent peptide, if it exists, should be much shorter than that assumed from the results mentioned above. Another interpretation of the experimental data on the protection of the nascent peptide by ribosomes against enzymatic attack can be proposed: the nascent polypeptide goes from PTC through a channel or groove on the ribosome surface, rather than through an intraribosomal tunnel. In such a case, different point of the polypeptide pathway on the ribosome surface may be accessible for different enzymes. In accordance with the above, immune-electron microscopy revealed the exit of the hapten-labeled N-terminus of the nascent peptide on the ribosome surface immediately at the region of PTC and nearby, i.e., in the cleft between the central protuberance and the L1 side protuberance of the large ribosomal subunit (Ryabova et al., 1988). These results argued against an intraribosomal tunnel for nascent peptide. The discovery of cytosolic "nascent peptide-associated complex", or NAC (see below) capable of binding to the C-proximal section of the ribosome-associated nascent peptide has provided an alternative interpretation of the results cited above: no intraribosomal tunnel for nascent peptide exists, and it is NAC that, by covering a nascent chain, gives the appearance of the existence of the putative ribosomal tunnel (Wang et al., 1995). According to a recent model, the nascent polypeptide chain protrudes from the ribosome immediately at the PTC, but is seized and screened by special soluble proteins. This protein complex called NAC in the eukaryotic cell consists of two polypeptides, a (33 kDa), and b (21 kDa) (Wiedmann et al., 1994). NAC associates with the peptide-carrying ribosome and makes the section of the growing polypeptide up to 30 to 40 amino acid residues inaccessible for interactions with surrounding macromolecules. No experimental information is available about the conformation of the nascent polypeptide in the complex with NAC. It is not excluded that a-helix may be also a preferable conformation due to its generation by the peptidyl transferase center, its stabilization by the C-end fixation and its universality. 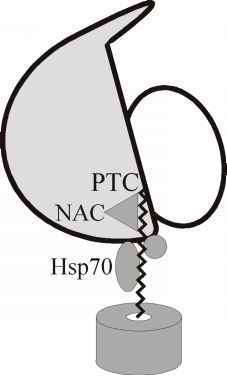 Thus the discovery of NAC capable of binding to the C-proximal section of the ribosome-associated nascent peptide has provided a principally different interpretation of the results mentioned above: it is NAC, but not the ribosome, may cover a nascent chain section adjacent to PTC. At the same time, due to the dynamic character of NAC association with ribosomes, the protection of the C-terminal section of the nascent peptide may depend on interactions with other macromolecules and on co-translational folding of the peptide. The recent studies of co-translational protein folding has shown that the folding into tertiary structure can involve the C-proximal part of the nascent peptide including the amino acid residues immediately adjacent to PTC (see, e.g., Komar et al., 1997). These findings also contradict the concept of the intraribosomal tunnel for nascent peptide and are consistent with the idea that the formation of a stable tertiary structure can outcompete the NAC binding. In any case, beyond the section of 30 to 40 residues, or less, adjacent to the C-terminus (PTC), the N-terminal part of the nascent peptide becomes accessible for the environment. From his point all the external factors responsible for polypeptide folding come into effect. However, several circumstances make this situation different from that observed in the case of the spontaneous renaturation of unfolded protein in vitro. First, if the ribosome creates and maintains a certain universal conformation of the nascent peptide, e.g. the a-helix, then the protein folding may begin not from an extended or a random coiled state of the chain, but from the given initial (starting) conformation. Second, the search for a folding pathway does not begin randomly from any region of the polypeptide chain but proceeds sequentially from the N-terminal part. Third, in the course of folding, the C-terminus is fixed at a bulky particle and, therefore, its mobility is limited; this should result in the intermediate conformations having a higher stability than the analogous structures of the free polypeptide chain. Fourth, the environmental conditions, such as ionic composition, charges, polarity, in vicinity of ribosome surface may be very different from those in solution. Fifth, special protein factors, including some molecular chaperons (see below), may interact with the ribosome and thus modify the process of cotranslational folding. Figure 18.1. Stereoscopic representation of a wire frame model of the incomplete globin chain (86 amino acid residues) with its C-terminus at the peptidyl transferase center (PTC) of the ribosome. The growing chain is assumed to acquire the same folding pattern as the corresponding N-terminal section of the complete globin; E and F designate the helices of the globin mainly responsible for heme binding. (A. A. Komar, A. Kommer, I. A. Krasheninnikov & A. S. Spirin, J. Biol. Chem. 272, 10646-10651, 1997). ts correct arrangement relative to the preceding E helix. In this case no indications have been obtained on the shielding of the C-terminal section of the nascent peptide by the ribosomal tunnel or by NAC. Thus the folding into tertiary structure can involve the C-proximal part of the nascent peptide including the amino acid residues immediately adjacent to PTC. It is likely that, in contrast to renaturation of the free unfolded polypeptide in vitro, attaining the correct final conformation of protein on the ribosome proceeds more directionally and is therefore quicker and more reliable. In other words, the ribosome may contribute to a certain folding pathway. This contribution from the ribosome could include at least such factors as the determination of the folding sequence from the N-terminus to the C-terminus; the setting of a certain initial (starting) conformation, specifically j and y angles, for each amino acid residue; and the stabilization of intermediate local conformations due to the fixation of the C-terminus. An important role in the cotranslational polypeptide folding may be played by cytosolic molecular chaperones (for reviews, see Ellis & van der Vies, 1991; Gething & Sambrook, 1992; Jaenicke, 1993; Hartl, 1996). There is evidence that in Eukaryotes ribosome-bound nascent chains can be associated with two heat shock proteins, Hsp70 and Hsp40, known as chaperones serving to prevent polypeptide aggregation and to maintain them in a folding-competent form, as well as with the large hetero-oligomeric ring complex (TRiC) ensuring ultimate folding of released polypeptide chains (Beckmann et al., 1990; Nelson et al., 1992; Hendrick et al., 1993; Langer et al., 1992; Frydman et al, 1994; Hartl, 1996). Corresponding analogues in Escherichia coli cells are the DnaK/DnaJ pair and the GroEL oligomer, respectively. At least in some cases the removal of any constituent of this entire chaperone/chaperonin machinery results in misfolded polypeptide chains lacking natural physiological activity. It has been shown that a growing polypeptide chain binds initially with Hsp70 in cooperation with Hsp40. The binding occurs as soon as a section of about 50 amino acid residues emerges beyond the NAC binding site of the nascent chain. After additional 100-150 steps of elongation the polypeptide chain can be further captured by the TRiC oligomer. As a result, a transient complex including all above proteins, i.e., the ribosome-bound nascent chain, Hsp70, Hsp40, and TRiC, can be formed (Fig. 18.2). After termination of translation, the polypeptide chain released from the TRiC complex is assumed to be ultimately folded. This model admits that nascent chains can undergo folding domain-wise (Netzer & Hartl, 1997). A minimal polypeptide domain folded cotranslationally may include about 100 amino acid residues or somewhat less. The interaction of nascent polypeptide chains with Hsp70/Hsp40 (DnaK/ DnaJ) and TRiC (GroEL) is an ATP-dependent process involving some additional regulatory proteins. This matter, however, is beyond the scope of the book. Thus, a nascent polypeptide chain emerges from the ribosome and enters into a putative "tunnel" formed by NAC very soon after initiation of its growth (after 12 initial steps of elongation or less) (Wiedmann et al., 1994; Wang et al., 1995). The polypeptide chain can be further captured by the chaperone/chaperonin machinery (Hartl, 1996). However, this model holds only for the proteins synthesized in the cytosol on so-called free polyribosomes, i.e., polyribosomes that are not associated with any intracellular membrane. Figure 18.2. Model for complex formation of the eukaryotic translating ribosome with NAC (B. Wiedmann, H. Sakai, T. A. Davis & M. Wiedmann, Nature 370, 434-440, 1994), Hsp40/ Hsp70 and TRiC during the co-translational folding of cytosolic proteins (F. U. Hartl, Nature 381, 571-580, 1996). Polypeptides consisting of more than one domain may be folded by stages (W. J. Netzer & F. U. Hartl, Nature 388, 343349, 1997). In both prokaryotic and eukaryotic cells, a significant portion of the ribosomes organized into polyribosomes can be attached to membranes. In Prokaryotes the polyribosomes may reside on the inner surface of the cell plasma membrane, whereas in Eukaryotes the membrane-bound ribosomes are located on the rough endoplasmic reticulum (REF) of the cytoplasm (see Figs. 4.2 and 4.6). It was demonstrated long ago that eukaryotic ribosomes attach to the membrane through their large (60S) subunit (Sabatini et al., 1966). The 60S subunit appears to have a special site with affinity to the membrane of the endoplasmic reticulum. Therefore, all ribosomes attach to the membrane through a strictly fixed point in the same orientation. In this orientation the axis connecting the large and the small subunits is roughly parallel to the membrane surface (Fig. 18.3). Electron microscopy of eukaryotic ribosomes demonstrates that the long axis of the small subunit is roughly parallel to the membrane surface (Unwin, 1979; Christensen, 1994). This leads to the assumption that the attachment of the ribosome to the membrane takes place at the side of the lateral protuberances of the subunits (equivalent to the L1 ridge of the 50S subunit and the platform of the 30S subunit of E. coli ribosomes; see Section 5.3); the region of the presumed "pocket" for tRNA and the stalk of the large subunit should be at the side turned away from the membrane. 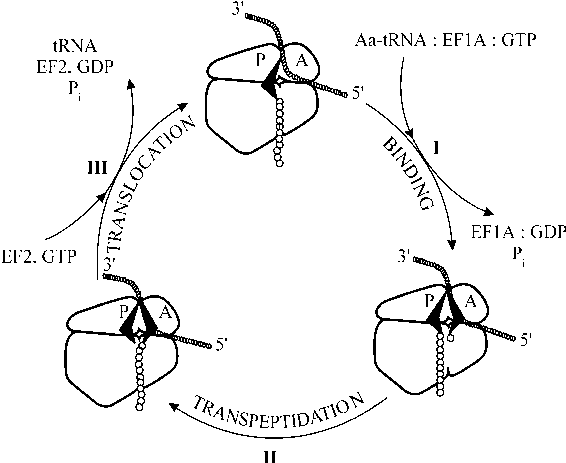 In such a case, according to the presumed trajectory of mRNA movement through the translating ribosome (Fig. 9.5), the mRNA chain should go more or less parallel to the membrane surface. Schematic representation of a membrane-bound polyribosome is given in Fig. 18.4.